These are brand new original Molot manufactured metal magazine releases for the Vepr 12 shotgun. 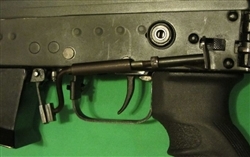 For best performance, should be used without the left side safety lever (although can be installed and used without removing the safety lever) and with the flared magwell (sold separately). Does not require welding or permanent changes to the firearm, it bolts on and can be installed in minutes. Due to poor packaging at shipping, has some scratches.